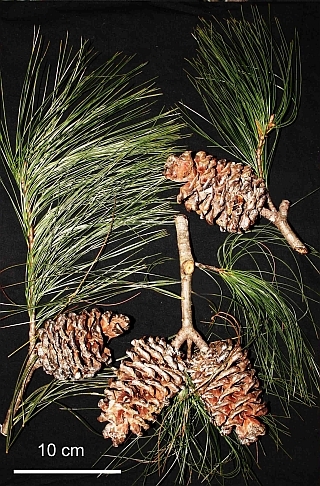 A recently described five needle pine, currently only known from a small area of northwestern Vietnam. 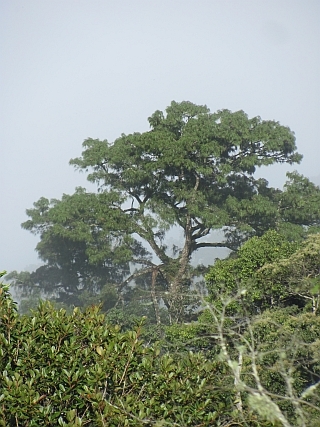 It is threatened by selective felling but has not yet been evaluated for the IUCN's Redlist. It is likely to be assessed as Critically Endangered due to its very restricted distribution and an ongoing decline. A medium to large tree up to 35 meters in height with a bole up to 1 meter in diameter. Needles in fascicles of five, slightly twisted, 15-22 cm long, drooping. Cones in whorls of 2-6, 8-11 cm long and 5-7 cm in diameter. Currently, this species is only known from the Pha Luong Mountains along the border of Houaphan (Lao PDR) and Son La (Việt Nam). 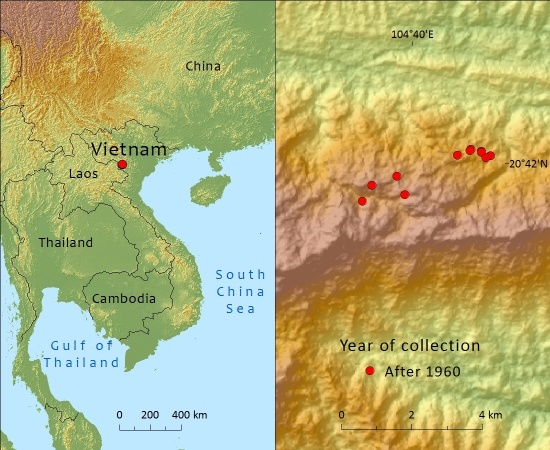 Several surveys have been undertaken on the Vietnamese side and have found 12 localities within a small area. Surveys on the Lao side are needed. Timber is used for local construction. The extent of occurrence is estimated to be less than 100 km² with an area of occupancy considerably less. Twelve localities are currently known but these are within 2 km of each other. 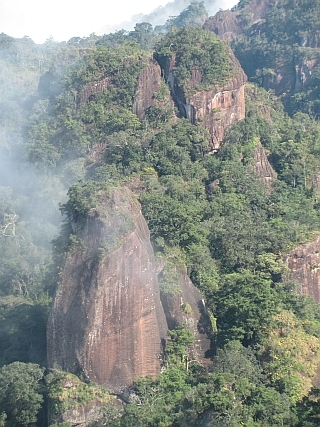 Logging is an issue as are uncontrolled fires associated with deforestation. An global assessment of Critically Endangered under B1ab (iii,iv) would be appropriate based on current knowledge. The majority of the stands are located within the Xuan Nha Nature Reserve. PanNature, a Vietnamese NGO has initiated a community based conservation programme that involves, amongst other things, seed collecting, cultivation and the reinforcement of existng stands. Surveys on the Lao PDR side of the border should be undertaken as soon as possible. Averyanov, L.V., K.S. Nguyen, T.H. Nguyen, D.K. Harder (2015). Preliminary assessment for conservation of Pinus cernua (Pinaceae) with a brief synopsis of related taxa in eastern Indochina. 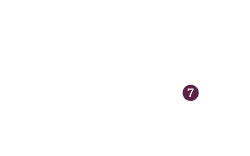 Turczaninowia 18(1):5-17. Philp Thomas, 2015. Pinus cernua, from the website, Threatened Conifers of The World (http://threatenedconifers.rbge.org.uk/taxa/details/1101).